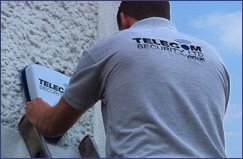 Maintenance is an important part of any electronic security system. A fully maintained security system ensures that in the case of a break in, fire or theft, your system will be fully to keep you and your possessions safe. Our maintenance contracts include periodic checks of the system, 24 hour help-lines and the peace of mind that if there is a problem with your system, day or night, 365 days of the year, we are only a phone call away to help solve any problem over the phone or with a visit from an engineer within 4 hours. Inspect all major components and cabling for signs of deterioration. Test signal with Monitoring Centre.